Dimensions:4" x 4" x 5" Disclaimer: Ships to Continental US only! &..
Fiesta Flutes Set of 6 (SKU TG119). Each piece is individually crafted in a labor-intensive pr..
Sip bubbly carefree from flexible stemless flutes that won’t break or get bumped over easily. ..
Mardi Gras Flutes Gold Set of 6 (P/N 710420). A set of 6 stemless flutes with glass detailing ..
Mardi Gras Flutes Set of 6 (P/N TG571). Made from hand-worked borosilicate glass, these textur..
On the Go Gift Pairing (p/n 16664) with free gift wrap. Canvas Totes Environmentally frien..
Ravenscroft Crystal is the future of glassware for the wine enthusiast. Form follows function in the.. Rooted in centuries of Venetian glassmaking tradition, crystal offers the purest, most elegant drink.. Statement drinkware deserves a place in any connoisseur’s cabinet. 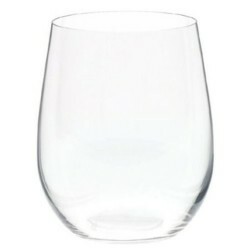 Nothing fits the bill bette..
Ribbed 18oz Stemless Wine S/4 Disclaimer: Ships to Continental US only! ..
Riedel O Oaked Chardonnay Set of 2 (P/N 0414/97). You'll want Riedel O to be the first on the..